Like the original from which it is adapted, this traditional Windsor settee is made from maple, pine and oak. Each wood is utilized in different elements for structural reasons. For example, the gently curved serpentine crest rail on the back is made of oak, which could be bent without risking splintering and is strong enough to take the stress of holding the back spindles. In order to harmonize these different woods, Windsor style furniture tended to be painted. This settee is available in a paint or natural wood finish, and in an aged and distressed paint finish. 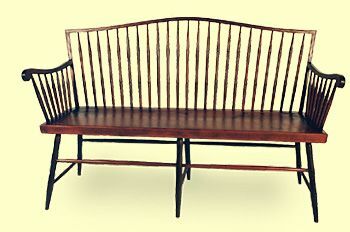 It works very well with the "Rod Back" Windsor chair shown in this product section which also has a serpentine crest rail and bamboo turnings.